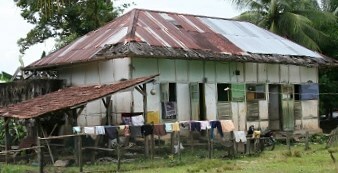 Dutch home built in the early part of the 1900’s, still in use by several Indonesian families. 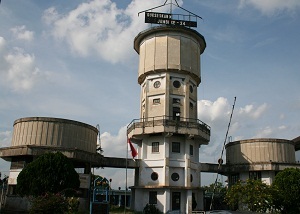 Water Tower in the City of Jambi. The tower is referred to as being the Dutch benteng (fort). The City of Jambi has within it a water tower that was built in 1928 by the Dutch during the colonial period. The water tower was built specifically for the storage and distribution of water. Confusingly, the tower is always referred to as the Dutch “benteng” (fort), yet it was never used as such. Many in the City of Jambi are under the impression that the water tower was at one time used as a Dutch fort.